An Automatic Weather Station (‘AWS’ for short) is an electronic device that measures common weather readings such as air temperature, wind, rain, atmospheric pressure etc. It’s automatic in the sense that it will continue to report weather readings for extended periods – months to years, for instance – without any attention beyond very occasional maintenance like changing a wireless transmitter battery or cleaning the rain gauge. (In case you’re wondering, the rain gauge is self-emptying day to day and so needs no routine care). The weather stations that we sell consist of two main parts: A set of outside sensors which actually measure the weather values (sensors for the VP2 model are shown right) and then a display console unit, usually located indoors and which provides a live readout of weather readings on a built-in LCD screen (see image below right). The outdoor and indoor components typically communicate by wireless, although there is a wired alternative on certain models. The weather readings update every few seconds, making the display a fascinating watch in windy weather. 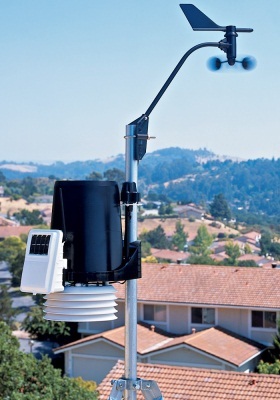 A key feature of modern weather stations is their ease of connection to a PC (or Mac) and also of uploading to a live weather website. Let’s be clear: if you really don’t get on with computers, you can use our weather stations perfectly well without a PC connection. But PC-linking does add hugely to the benefits and enjoyment of the station and, in practice, the great majority of customers do specify the PC data logger pack. The extra descriptions below will hopefully provide an easy introduction to our weather station products, but feel free to phone or email us if anything still isn’t clear – we’re very used to talking to customers who have never bought a station from us before. No question is too basic! 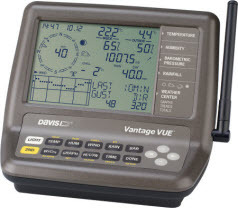 We offer two distinct ranges of Davis weather stations: the Vantage Vue (display console shown right), which is the more basic but cheaper model (from under £300); and the Vantage Pro 2 family of stations, which are expandable and hugely flexible for more advanced applications. (Follow the links for a quick introduction to the Vue and VP2 stations.) We also sell the highly distinctive Instromet stations. The Vantage Pro 2 models allow many additional types of sensor to be added, including sunshine intensity, UV exposure, additional temperature and humidity readings, soil moisture (for gardeners and farmers) and various other optional sensors. VP2 models also have other benefits, such as a larger display. More information is available on the introductory pages for the Vantage Vue and Vantage Pro 2 station types. The display consoles will allow you to see current weather conditions and – especially if you have a PC connection – to create a detailed log of past conditions, but please remember that a weather station is not primarily a weather forecasting device (although all of our stations can provide a simplified forecast for a few hours ahead). Data logger, PC, website etc. As mentioned above, connecting a weather station to a PC can add hugely to its capabilities for visualising your weather data as impressive graphics and for reviewing and storing the weather records in considerable detail. No other accessory will give you more benefit and satisfaction than adding the data logger for linking to a PC and, if you wish, to a website also. Uploading the weather data automatically to a website adds a whole new dimension for sharing your live weather data with the world at large. Even if you hate computers, we have data logger models that will take care of uploading your data to a website without even needing a PC at all (see reduced image left). For the stations we sell, a data logger pack is essential for linking the station to a PC. The logger is a true data logger being able to store the weather data for extended periods (days to months, depending on its settings) without needing to be attached to a PC. More information can be found on our introductory page about connecting to PCs and to websites. Finally, a word about siting the weather station sensors. To get maximum accuracy in the weather readings, the weather sensors should really be correctly exposed. In a nutshell, the anemometer (for measuring wind speed and direction) should ideally be as high as possible, while the other sensors should be closer to ground level and in as clear and open a space as possible. The mounting hardware for the sensors (pole, post etc) is the only item not included with the weather station. We sell both a tripod and a short (1m) pole as optional extras, although it’s often easiest to source a suitable pole locally. In practice, it’s very often impossible to meet these idealised requirements exactly, either because of the design of the station (as with the all-in-one design of the Vue) or because of limitations in where the weather station has to be located, and so some compromise in siting is unavoidable. Don’t worry overly about this – in most cases the station will still read to an acceptable standard – but do try to get as close as possible to the preferred siting conditions. Remember also that you will occasionally need to get access to the sensors for maintenance, so don’t make them impossible to reach once installed. There is a lot more information about preferred mounting positions under our main Advice menu on the Sensor Siting pages. A more detailed general page introducing our weather stations is available here.